BEACH CHAIRS & UMBRELLAS PROVIDED AT NO CHARGE! Beach Baby offered our family of six the best vacation to date! This one story, cozy retreat was absolutely perfect. Zero steps to the beach= relaxation for parents of young children! The accessibility was everything. We’ve booked it again already! Thank you for your review. We are glad that you enjoyed your stay, and we look forward to this next year, and seeing you again. We are glad you enjoyed your stay, we look forward to your next stay with us. The bed in the master bed room on the right side of the house need a new mattress. The bed was very lumps and the sheets would not stay on the corners. Not a comfortable bed. We enjoyed our week at Beach Baby! I was looking for a place with limited amount of stairs, as my husband has limited mobility. He and I had stayed here many years ago when only 3 bedrooms were available. I was surprised that the newest bedroom had a step down to enter and so he was unable to use that room, which was unfortunate in that it had the only walk-in shower. We used the spacious king bedroom near the dining room, which worked out okay other than he was unable to get his walker through the very narrow doorway. Also, we never could get the TV in our room to work. The kitchen was stocked very well with pots, pans, lovely dishes and the usual utensils. This is important to us because we tend to dine in at night. The kitchen could use a few oven-safe casserole dishes smaller than 9"x13", for side items and hot dips. Not really a deal-breaker, of course. I travel with my own chef knives, so I can't tell you about theirs. A non-wooden cutting board for preparing raw meats would be a nice addition. The house sits directly on the beach, so the view is wonderful with easy access to the beach. 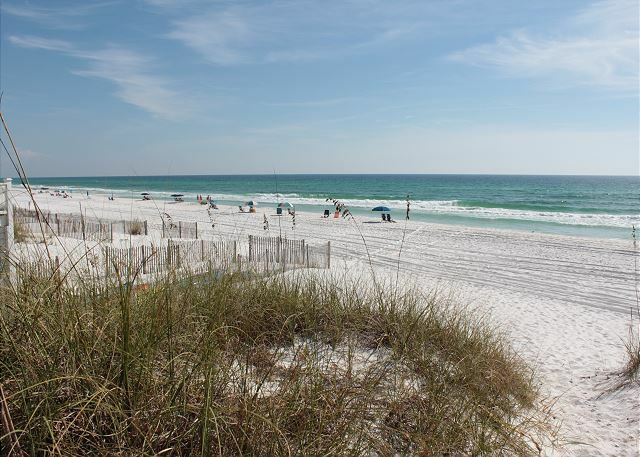 There is also public access one door down, so expect a busy beach if you go in June. We did have an issue with the gas grill, but that was professionally handled by the management company. Thanks again for responding so quickly! All in all, it was a lovely vacation in a comfortable home. I would recommend this property. P.S. to home owners remodeling their properties: Please consider walk-in/roll-in showers with handrails in at least one bathroom of your property. The elderly & disabled would greatly appreciate your thoughtfulness. :) Thanks! Perfect for 3 sets of grandparents (sans grandchildren). 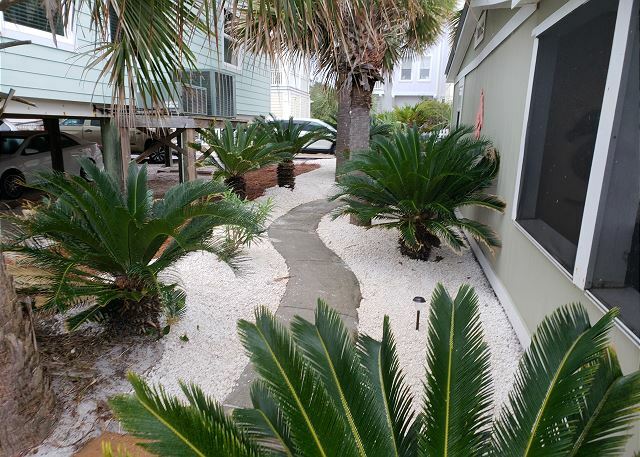 This is an older, 1-story home right on the beach which is very rare. 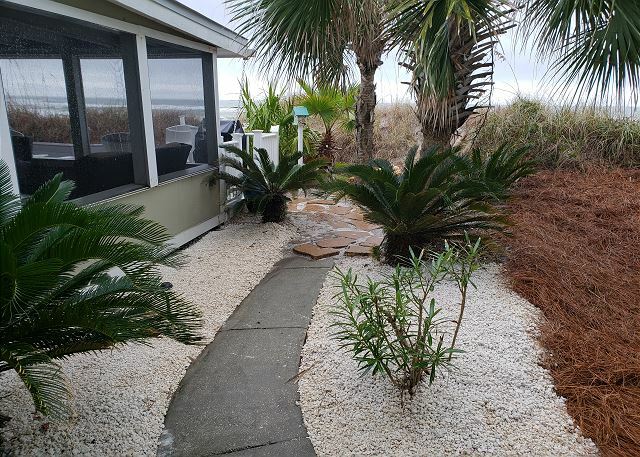 Magnificent screened porch which leads to a sunny patio which leads directly to the beach. A slight hill, but no steps! House itself shows signs of age. Beach baby is great! The location absolutely can't be beat, you walk out the backdoor directly to the sand. That made going to the beach with three small children SO much easier. The huge walk-in shower with two showerheads was perfect for getting the kids cleaned up after a beach day. Beds are very comfortable, there's brand new carpeting in two of the bedrooms (all flooring everywhere else is hardwood or tile). The back screened in patio is HUGE and great for hanging out at night. The property management company was wonderful to work with, Gary is awesome! We'll definitely be back! 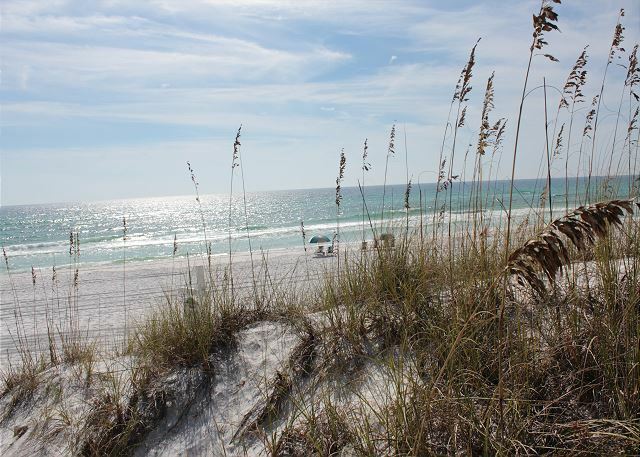 A great location, the best access to the beach! So glad you enjoyed your stay, hope to see you again soon.